Smart’s support for the national basketball team is in line with its advocacy of promoting sports development as part of nation-building. Returning from the FIBA U-17 World Cup last month, Philippines’ under 18 men’s national basketball team Batang Gilas is set to play again on the international stage at the FIBA U-18 Asian Championship in Nonthaburi, Thailand on August 5 to 11. During their sendoff practice, PLDT and Smart showed solid support by providing Smart Travel Wi-Fi units and premium load cards for PLDT’s international calling service Free Bee, which proved useful to the team when competing abroad. Aside from enabling communication, Smart’s assistance also allowed the team to research and plan their plays. During the FIBA U-17 World Cup in July, Batang Gilas was grouped with the ‘toughest teams’—European countries France, Croatia, and host Argentina. “We got to study the competing teams’ strengths and weaknesses as part of the preparation,” Lao added. With the addition of 6’10” Fil-Nigerian Ariel John ‘AJ’ Edu and 6’1” Fil-Italian Dalph Panopio, Batang Gilas is indeed transitioning into a powerhouse against Asia’s bests. “I’ll do everything in my power for us to qualify in next year’s World Cup,” said Panopio, 18, who has already won several awards playing for Stellazzura Basketball Academy, an all-around training program for international athletes who aspire to compete at the highest level in basketball. Batang Gilas U-18 roster includes ADMU’s Kai Sotto and Geoff Chiu, NU’s Gerry Abadiano, Dave Ildefonso, Migz Oczon and Joshua Ramirez, DLSU’s Raven Cortez, San Beda’s Rhayyan Amsali, FEU’s Xyrus Torres, and key additions AJ Edu and Dalph Panopio. 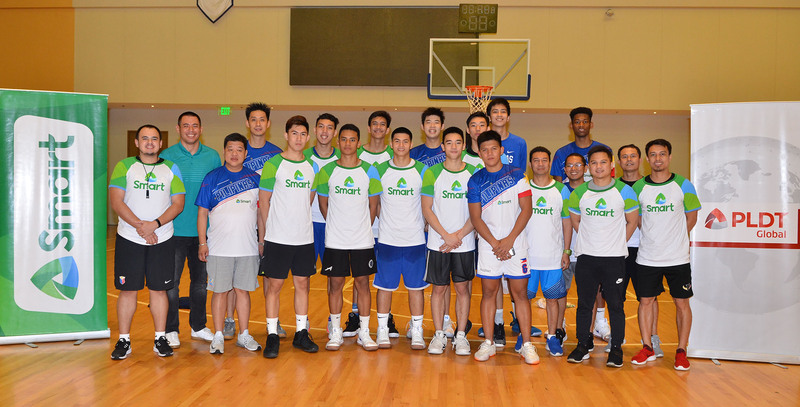 Smart has been a staunch supporter of the Gilas Pilipinas program since 2008, a program managed by Samahang Basketbol ng Pilipinas (SBP). “We are proud to support the Batang Gilas for their competition in Nonthaburi, to try and qualify for the FIBA U-19 World Cup next year,” said Gabby Cui, Smart assistant vice president and head of community development and partnerships. Batang Gilas is grouped with China, Lebanon, and United Arab Emirates for FIBA U-18 Asian Championship. The top four teams which will emerge from the league will represent the region in FIBA U-19 World Cup next year. This article originally posted on Smart’s website. Read more about their journey here.